Veliko Tarnovo is an enchanting Bulgarian city, easy to fall in love with and is the perfect place to learn Bulgarian. Veliko Tarnovo is an enchanting and historical city with a population of roughly 70,000. It is one of the few Bulgarian cities today with a growing population and proves very popular with both Bulgarian and foreign tourists. Many people who come to Veliko Tarnovo for the first time fall in love with the city and end up spending much longer here than they initially planned. Stories of visitors who have popped in on a fleeting visit and ended up living in Veliko Tarnovo permanently are not uncommon. The Yantra river flows through the city and the nearby Balkan mountains provide a dramatic backdrop. The university 'St. Kiril and Metodi' is named after the founders of the Cyrillic alphabet, was opened in 1965 and is one of the largest and most repected universities in Bulgaria. Many young Bulgarian students come here to study Bulgarian and to specialise in the language. Veliko Tarnovo is one of the oldest Bulgarian settlements with evidence of human habitation found in the city dating back to 3000 BC. 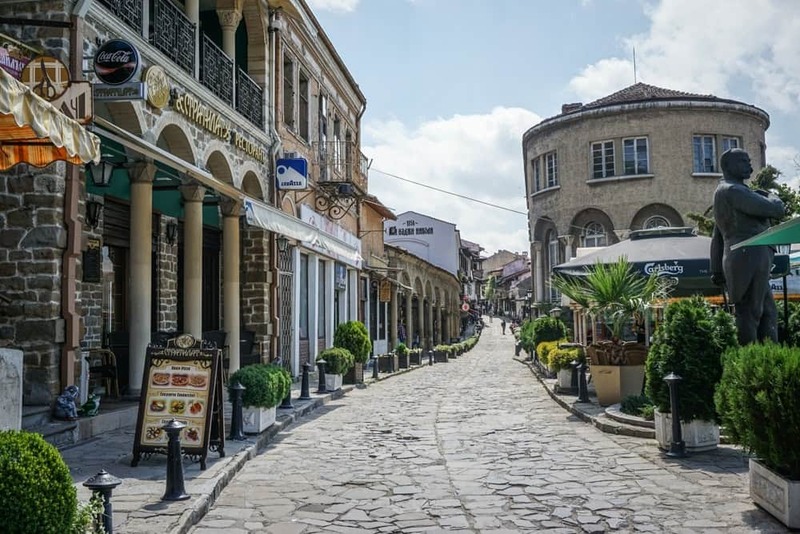 The city was strongly fortified between the 12th and 14th centuries and was a hub of the resistanace and uprisings in the long struggle with the Ottomans who ruled Bulgaria for 500 years. After the end of Ottoman rule the Bulgarian city of 'Tarnovo' was renamed 'Great Tarnovo' (Veliko Tarnovo) in 1965 to reflect its important stature, rich history and importance as one of the main Bulgarian cities. Veliko Tarnovo has often been referred to as the 'City of the Tsars' and in the Middle Ages was even considered by many to be the '3rd Rome' because of its reputation as one of the most important centres of culture in Europe. Veliko Tarnovo has always been an iconic city for Bulgarians and is located almost right in the centre of the country 3 hours from the coast and three hours from the now capital city of Bulgaria - Sofia. It was in Veliko Tarnovo that Tsar Ferdinand declared total independence of Bulgaria from Ottoman rule on 5th October, 1908. Bulgarians still celebrate this day every year and many people come to Veliko Tarnovo to join in with the annual commemorations. There are so many things to do in and around Veliko Tarnovo you are really spoilt for choice and an extended stay is highly recommended to be able to get round the best of the sites. Here is our top three must-do things when in Veliko Tarnovo. 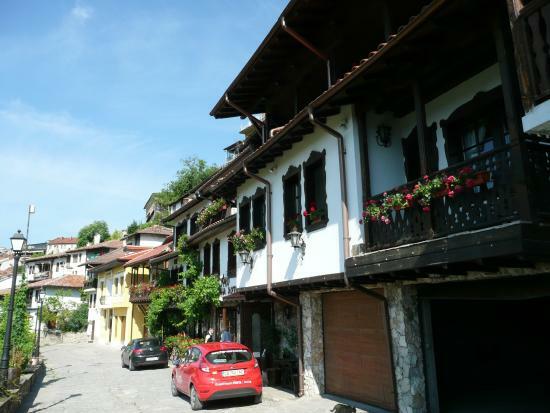 Of course there are many more things to do in Veliko Tarnovo that have been visited and reviewed by previous visitors. Tsarevets fortress is located on a hill on which evidence of human habitation dating back to the third millenia BC have been found. In the 5th and 6th centuries it was one of the largest cities in the Bysantine province of Lower Moesia. In the 12th century the fortification of the city began with a defensive wall stretching over 1000 metres, almost 4 metres thick and 10 metres high. Much of the wall can still be seen today and stretches of it has been re-built. Tsravets was the main fortification of the city in 1185 when Tarnovo became the capital of the Second Bulgarian Empire. You will be learning Bulgarian in a city steeped in history. There was a royal palace complex within the inner walls and for whoever can climb to the top of the hill will be able to explore the Patriarchal Church overlooking Veliko Tarnovo and out towards the Balkan mountains. 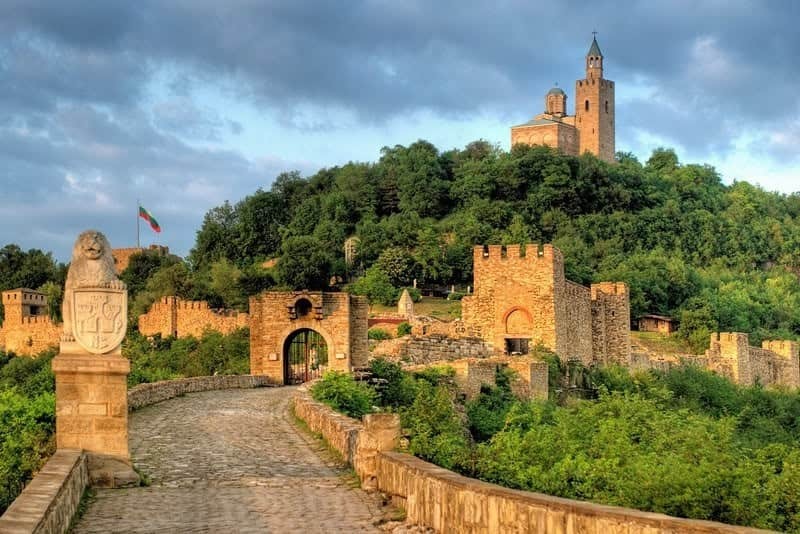 (Here you can watch a live web-cam of Veliko Tarnovo and the Tsarevets fortress. It looks like a painting at first but if you look carefully you can see cars coming up the hill and people walking back and for to the fortress). In between your Bulgarian lessons you can take a gentle stroll down the 'Samovodska Charshiya' - the old historical quarter of Veliko Tarnovo which is a charming cobbled street lined with antique shops and typcial Bulgarian art and craft workshops where you can see locals craftsmen chipping and carving as part of their trade. There are also an array of small shops, one of the best restaurants in town, a museum, a popular cafe with a large inviting outdoor terrace as well as historical buildings with interesting architecture. The 'Hadji Nikoli' building is probably the most impressive and has been relatively recently completely restored and refurbished. The project took over 2 years and won many architectural prizes for its authentic restoration. The buidling hosts a top restaurant, an intimate courtyard, a museum, a wine bar and an art gallery. 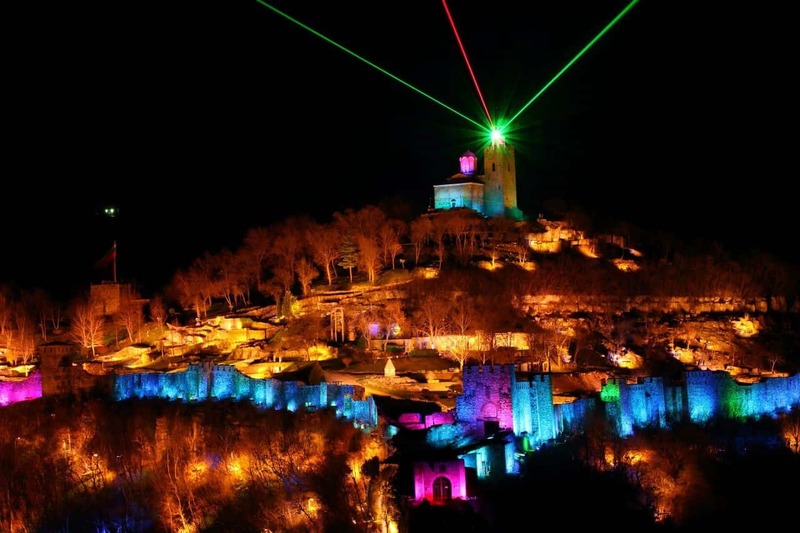 At night there is also a spectacular sound and light show staged at Tsarevets fortress that you can watch for free from the square at the bottom of the hill. You can also choose to pay and sit in the warm in a vantage point overlooking the fortress. The show is not put on every night so you need to check although during the summer season the show is put on almost every weekend because of popular demand from the swell of tourists. We often take our Bulgarian lessons students to watch the show during their stay in Tarnovo. The sound and light show re-tells the story and history of the different Bulgarian states and makes for impressive viewing. Hostel Mostel is a charming family-run hostel in close proximity to Tsarevets fortress and is itself a renovated authentic Bulgarian house. The Bulgarian family who run it are extremely pleasant and the accommodation is very popular, especially with travellers. The hostel does have a few individual and smaller rooms with en-suites. Prices are very good value for money and include: All-you-can-eat breakfast; High speed unlimited Internet access; A glass of beer; Light diner; Fresh and clean sheets, blanket and towel;24 hours hot showers. As well as being able to practice your Bulgarian with the local staff there are also a diverse range of other languages to be heard amongst your fellow guests. 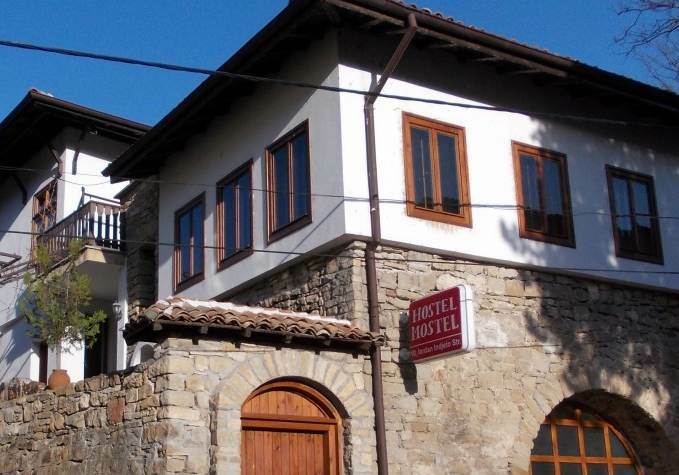 Hotel Gurko is again a family-run hotel that is located on the historical and picturesque Gurko street overlooking the Yantra river and the striking 'Asenevtsi' monument. It is a little more expensive than our other accommodation suggestion but has roughly 20 luxury rooms all with a bathroom, toilet, mini-bar, air conditioner and cable TV. Put your Bulgarian lessons into practice in the hotel's traditional Bulgarian restaurant serving typical Bulgarian food and drink. "This is an excellent program. While only visiting Bulgaria for a long weekend, I wanted to obtain a least a little familiarity with the alphabet and language. In just 5 hours of Skype lessons with Iliyana, I was able to attain a working knowledge of the Bulgarian alphabet and numerous words and phrases relevant to my trip. This information greatly enhanced my experience in Bulgaria and ability to interact with locals..."
"Studying with Iliyana is a real pleasure. From day one, she has always been full of energy and very enthusiastic about teaching. It really makes you feel special. I am happy to recommend her to anyone wishing to learn Bulgarian..."
"I recently moved to Bulgaria with my wife and 2 year old daughter. My only exposure to Bulgarian language before coming was listening to my wife talk with her friends and family members. I couldn't understand a thing. Six months ago I met Iliyana and shortly thereafter began lessons to learn Bulgarian. Having never desired to learn a language and with little experience in doing so I didn't know what to expect. Before meeting Iliyana I had purchased textbooks and was trying to explore the language on my own. It was very challenging. At the first lesson, Iliyana broke down the Cyrillic alphabet for me in an easy and concise manner; before an hour was over I was able to read and write Bulgarian. Iliyana is able to consistently introduce new information in a manner that is relatable and understandable. She answers questions with real life applications and distinguishes between proper grammar for writing and colloquial pronunciation for casual conversations. Her lessons have been presented in a professional yet casual manner, that help me remain calm and focused while learning. Iliyana has an upbeat and positive attitude and I can tell that she genuinely enjoys teaching. I will recommend Iliyana to anyone interested in learning the Bulgarian language. With private lessons she is able to slow down when things are hard to comprehend or move faster when they're understood. She has made the lessons into something I enjoy doing...."
"I found learning Bulgarian with Iliyana interesting and a pleasure, the language is not easy especially as I am an older lady, but Iliyana made it simple and would go over anything I was not sure of as many times as was necessary. She is very supportive and encouraging, and I would and have encouraged other people to contact her if they are thinking of learning Bulgarian..."